Falling in Love with Stampin' Up! Swan Lake Stamp Set and Falling Petals Textured Impressions Embossing Folder! Check out Stampin' Up! 2017 OCCASIONS Catalog! 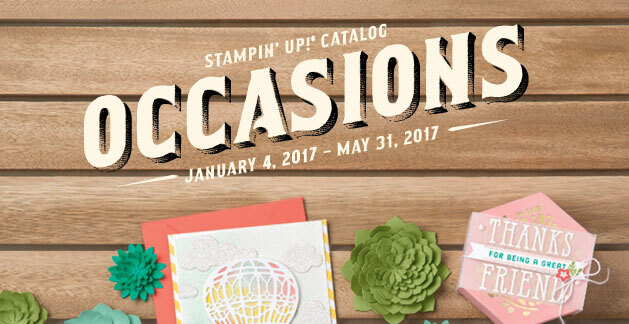 This weeks' DOstamperSTARS Challenge inspired the opportunity to highlight beautiful products in the 2017 Occasions Catalog! Supplies needed to create this 'Swan Thank You card' includes: Swan Lake Stamp Set #142974, All Things Thanks #143089, Falling Petals Textured Impressions Embossing Folder #142761, Watercolor Pencils #141709, Layering Ovals Framelits #141706, Pool Party Cardstock #122924, Pear Pizzazz Cardstock #131201, Very Vanilla Cardstock #101650, Pear Pizzazz Stampin' Pad #131180, Pool Party Stampin' Pad #126982. 1) Dry emboss Pear Pizzazz Cardstock #131201 with Falling Petals Textured Impressions Embossing Folder #142761. 2) Lightly sponge embossed cardstock with Pear Pizzazz Stampin' Pad #131180. Hint: sponge more ink on lower section of embossed image. Watch how the image comes to life, with so much dimension! 3) Die cut 3 Very Vanilla Cardstock #101650 with Layering Ovals Framelits Dies #141706 and mat with Pool Party Cardstock #122924. Stamp images with Swan Lake Stamp Set #142974 in Memento London Fog (retired) or Basic Gray Archival Stampin' Pad #140932. 4) Now for the fun! Play with your new Watercolor Pencils #141709 with your Aqua Painters #103954! Hint: Dab the aqua painter on the tip of the watercolor pencil and blend with water for a great watercolor effect! Example, swan image watercolor with Pacific Point Watercolor Pencils #141709. 5) Stamp and mat sentiment tag with All Things Thanks #143849 in Pool Party Stampin' Ink #126982. 6) Stamp inside images with Swan Lake Stamp Set #142974 in Basic Grey Archival Stampin' Pad #140932. Watercolor images with Watercolor Pencils #141709. Stamp sentiment with All Things Thanks #143849 in Pool Party Stampin' Ink #126982. Mat with Pool Party Cardstock #122924. Send and enjoy the fun of creating!